BOXER, A., L/Corporal, 20th London Regiment. He volunteered in August 1914, and on completing his training early in the following year, was drafted to France. There he took part in the Battles of Neuve Chapelle, Givenchy, Loos, Vimy Ridge, the Somme, Messines, Ypres, Passchendaele and Cambrai. He was taken ill and invalided home, and after his recovery, was engaged as an Instructor on physical training until his demobilisation in January 1919. He holds the 1914-15 Star, and the General Service and Victory Medals. 120, Gosterwood Road, Deptford, S.E.8. BOXER, J. H., Sergt., R.E. He volunteered in October 1915, and did continuously good work throughout hostilities on board of H.M. Tugs, conveying food supplies and ammunition from England to France. He was attached to the Inland Water Transport, and rendered valuable services until his demobilisation in March 1919. He holds the General Service and Victory Medals. 120, Gosterwood Street, Deptford, S.E.8. BOYCE, A. E., Private, Middlesex Regiment. Volunteering in August 1914, he was drafted to France after a short training later in the same year, and was engaged on special duties as a bomb-thrower in various sectors. He was invalided home suffering with severe frostbite in March 1915, but after his recovery rejoined his unit in the fighting line, and took part in many important operations. He gave his life for King and Country in July 1916, and was entitled to the 1914 Star, and the General Service and Victory Medals. 5, Goodrich Road, East Dulwich, S.E.22. BOYD, A. (Mrs.), Special War Worker. During the war this lady did continuously good work collecting money to make comforts for the men at the Front. She rendered valuable services with the Red Cross Society, and worked very long hours in order to benefit the fighting troops. 7, Kerry Road, New Cross, S.E.14. BOYLE, J., Sapper, R.E. He volunteered in 1914, and after his training served on the Western Front for nearly four years. During this time he did valuable work with his unit in the forward areas, and was present at many important battles, notably those of the Somme, Ypres and Arras. Owing to a severe wound he returned to England in 1918, and in May of that year was invalided out of the Service. He holds the 1914-15 Star, and the General Service and Victory Medals. 46, Mordaunt Street, Landor Road, S.W.9. BOYLE, J., Driver, R.A.S.C. Volunteering in February 1915, he proceeded overseas in the following year. Whilst on the Western Front he was engaged in conveying wounded to hospital from various sectors, including those of the Somme, Ypres, Peronne, Arras and Vimy Ridge. He was also present during the Retreat and Advance of 1918, and was later demobilised in April 1919. He holds the General Service and Victory Medals. 21, Trident St., Rotherhithe, S.E.16. BOYLE, J. A., Private, 9th Middlesex Regt. and 9th Royal Fusiliers. He volunteered in January 1916, and was in the following September drafted to France, where he took part in the Battles of the Somme (I and II), Vimy Ridge, Cambrai and Armentieres, and was badly wounded in action. As a result he was invalided home and later discharged in March 1919. He holds the General Service and Victory Medals. 68, Brocklehurst Street, New Cross, S.E.14. 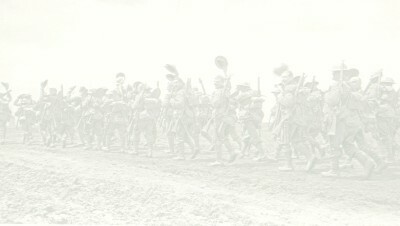 BOYNS, W. H., Private, 3rd Royal Fusiliers. Volunteering in October 1915, he was drafted to Salonika in the following June. Whilst in this seat of operations he took part in engagements on the Vardar, Doiran and Struma fronts and at the capture of Monastir. He contracted malarial fever, and was invalided home in August 1918. He was demobilised in February 1919, and holds the General Service and Victory Medals. 161, Shardeloes Road, New Cross, S.E.14. BOYS, T., Gunner, R.F.A. He volunteered in October 1915, and on completing his training in the following year proceeded to France. There he took part in the Battles of the Somme, Arras, Ypres. Passchendaele, Cambrai, Albert, Vimy Ridge and Lens. He did continuously good work throughout, and was demobilised in June 1919, holding the General Service and Victory Medals. 63, Camplin Street, New Cross, S.E.14. BRADBERRY, H., Rifleman, 13th K.R.R.C. He joined in December 1916, and on completing his training proceeded to the Western Front in March 1917. After only about a month's service overseas he was severely wounded in the Battle of Arras and was invalided home to hospital. Ultimately he was discharged as permanently disabled in October 1918, and holds the General Service and Victory Medals. 11, Reaston Street, New Cross, S.E.14. BRADBROOK, R. G., Bombardier, R.F.A. He joined in April 1916, and in the following year was drafted to the Western Front. During his service in France he fought at Arras, Vimy Ridge, Bullecourt, Passchendaele, Lens, Cambrai, the Somme, the Aisne, Amiens, Bapaume, Havrincourt and Cambrai and in various minor engagements. He holds the General Service and Victory Medals, and was demobilised in November 1919. BRADER, J. T., Leading Stoker, R.N. A serving sailor since 1906, at the outbreak of war he was posted to H.M.S. "Falcon" and served off the Coast of Belgium. Later he was transferred to H.M.S. "Rattle-snake" and afterwards did duty in H.M.S. "Grafton" and "Implacable" in the Dardanelles operations. After a period in hospital, owing to illness, he was engaged in H.M.S. "Hawkins" and was still serving in this vessel in the China Sea in 1921. He holds the 1914-15 Star, and the General Service and Victory Medals. 33, Angus Street, New Cross, S.E.14. BRADFIELD, C. W., 1st Class Stoker, R.N. He was serving at the outbreak of hostilities, and posted to H.M. Monitor "Prince Eugene" took part in the operations off the Belgian Coast, and in the bombardment of Ostend in conjunction with the Dover Patrol. After the Armistice he was transferred to H.M.T.B.D. "Versatile" and on two occasions was sent to Russian waters, where he was in action in numerous engagements against the Bolsheviks. He next served on board H.M. Mine-sweeper "Badminton" in which vessel he was still doing duty in 1921. He holds the 1914-15 Star, and the General Service and Victory Medals. 437, Rotherhithe New Road, S.E.16. BRADFORD, G., Rifleman, K.R.R.C. He joined in August 1916, and in the following December embarked for France. Whilst overseas he took part in several important engagements, and gave his life for the freedom of England on May 3rd, 1917. He was entitled to the General Service and Victory Medals. D14, Armada Street, Deptford, S.E.8. BRADFORD, T. H., Special War Worker. Throughout the war he rendered valuable services at the Royal Arsenal at Woolwich, and was engaged on duties of a most responsible nature. He carried out his important work in a highly efficient and commendable manner. 9, Chipley Street, New Cross, S.E.14. BRADISH, O. A., Corporal, R.A.F. He joined in February 1917, and after his training was engaged with his Squadron on important duties which called for a high degree of technical skill. He rendered valuable services at his depot, but was unable on medical grounds to obtain a transfer overseas, and was demobilised in February 1920. 3, Eythorne Road, Stockwell, S.W.9. BRADLEY, E. A. W., Private, Hertfordshire Regt. He volunteered in 1914, but was rejected on account of defective eyesight. In February 1916, however, he was accepted for service, and after completing his training served at various stations on important duties with his unit. He was not successful in obtaining a transfer overseas on account of physical unfitness for duty abroad, but rendered valuable services until demobilised in March 1919. 152, Ladywell Road, Lewisham, S.E.13. BRADLEY, E. W., Sapper, R.E. Having joined in January 1917, he was drafted to France later in the same year and was engaged in various sectors as an electrician. His work, which demanded a high degree of technical skill, was carried out with great efficiency, and he rendered valuable services. He was demobilised in November 1919, and holds the General Service and Victory Medals. 39, Mauritius Road, Greenwich, S.E.10. BRADLEY. F. W., Private, 2/4th Royal Fusiliers. Volunteering in February 1916, he crossed to France in the following January, and was in action at Arras, Bullecourt and Ypres, where in September 1917 he was severely wounded at Passchendaele, as to necessitate his return to England, and in the same month was invalided out of the Service. He holds the General Service and Victory Medals. 8, Calvert Road, Greenwich, S.E.10. BRADSHAW, E. E., Sergt., Queen's (Royal West Surrey Regiment). Volunteering in October 1914, he underwent a period of training prior to proceeding to France in August of the following year. He then took part in various engagements, including those at Loos and Ypres and in March 1916 was sent to the Base Depot, where he served on special duties in connection with the messing arrangements for newly arrived troops, until hostilities ceased. He was demobilised in February 1919 after returning to England, and holds the 1914-15 Star, and the General Service and Victory Medals. 47, Miall Road, Lower Sydenham, S.E.26.